A few weeks ago, we picked up this shelf at a yard sale. I neglected to snap a before picture but essentially the wood shelf was attached to a metal frame. The frame had some rust and the shelf certainly needed sanding, but otherwise it was a solid piece. The metal rack had some hooks which made me think it would be a nice addition to our storage challenged bathroom. I figured we could hang wet towels on the hooks and roll dry towels on the shelf. At first the lady wanted five bucks for it. Figuring it would make a nice form & function addition to our cramped bathroom, I reached into my pocket for the money. Then the lady noticed that someone had written $3.50 on it, so she sold it to me for that price instead. Go figure. ﻿﻿﻿It was probably a little overkill, but I sanded this board three times. First with a belt sander to do the heavy work of removing all the imperfections that time will do to an unfinished or worn piece of wood. Next I used a palm sander with slightly finer paper to give it a good consistent sanding so that it was smooth to the touch. Of course between each sanding, I used some Mineral Spirits to clean away all the micro saw dust. 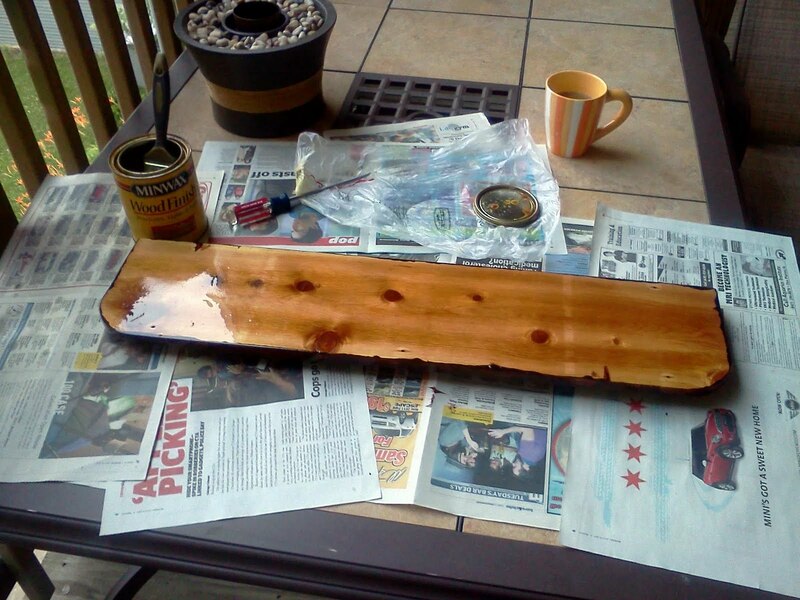 After that, it was a matter of applying some MinWax Polyurethane. 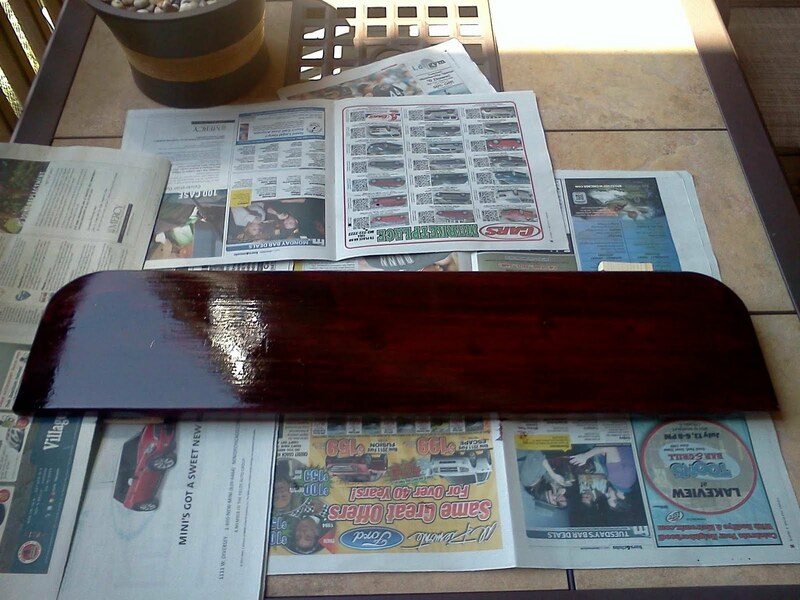 I used Bombay Mahogany Gloss 480 and applied two coats to the front and top. 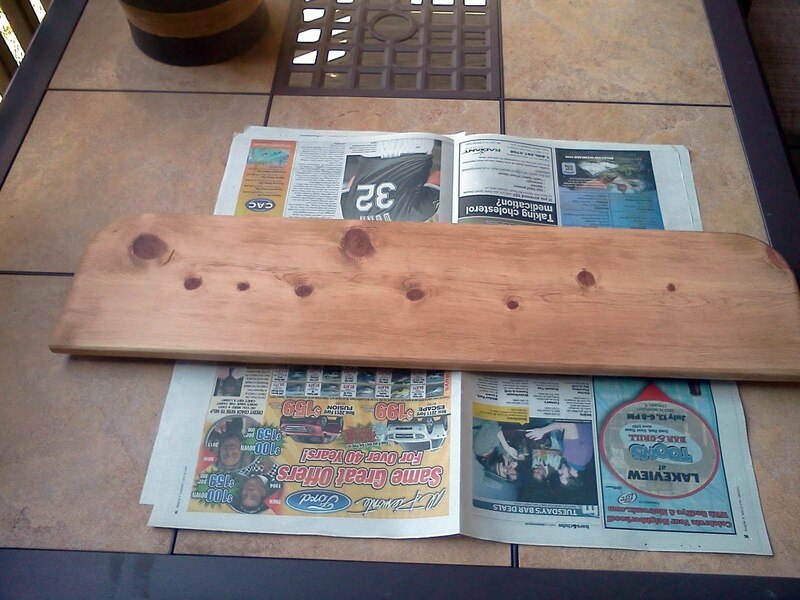 On the underside, I applied some MinWax Wood Finish (Natural 209) just to seal the wood. While that was drying I went to work on the metal frame. With some steel wool, I worked out the rust, also removing some of the black paint. My next step involved a trip to the suburbs. Sidebar: Like other urban centers, graffiti is a relatively big problem in Chicago. Our aldermen, in their infinite stupidity wisdom, decided to ban the sale of spray paint within the city limits. This had reduced the amount of graffiti by no measurable levels since gangbangers and taggers have cars. It does however make the law abiding citizen drive out the Home Depots in the suburbs to get a can of spray paint whenever they need to repaint their lawn furniture.